Although this website takes no cognizance of individuals, it does track the number of downloads and the country of origin. To date, there have been more than 52,000 downloads of Regress+ from 165 countries. Many thanks to all for your patronage and suggestions. 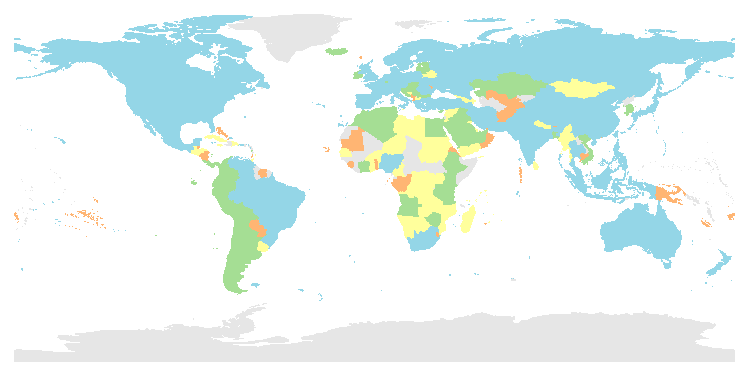 The figure below depicts countries with Regress+ users color-coded by quartile (see rankings) and those with no known users in light gray. If you have used Regress+ but your country is not listed, please send me an email note with details. Your return email address will serve to verify the correction. This page last updated on 1 April 2019.